Remember back a few weeks when the blogging world was buzzing with dips, like this Edamame Guacamole? It was the Super Bowl, which could possibly be the most important TV event of the year in the lives of many. For me, the Super Bowl doesn’t mean anything, but man, the Oscars, now those are something. If there’s one thing to know about me, it’s that I love film. Absolutely adore it, all genres, all aspects of films, it’s my passion. Now, my love of film means that I’m one of those who watches almost every Oscar movie, excluding a few documentaries and foreign films, I’ve seen ’em all. My favourite of this year’s nominees? Darren Aronofsky’s Black Swan – he’s a genius, and this film is a true masterpiece. Also, just saw Denis Villeneuve’s Incendies and am completely blown away. So, if you’re like me, and must be munching on something come Sunday when I sit around the TV rooting for my favourite movies of the year and discussing that disgusting dress or hideous hair so-and-so was sporting, I always need a snack, or a few, on hand. 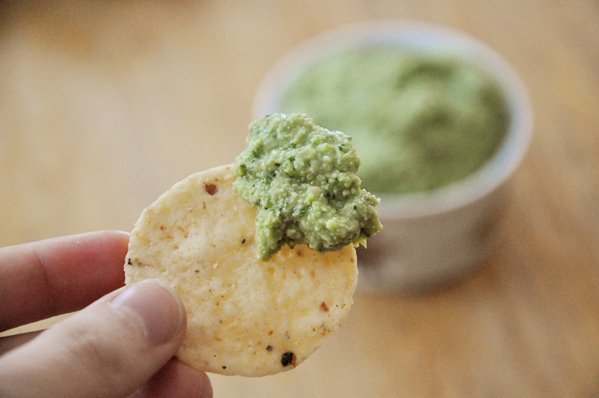 This edamame guacamole is definitely the dip I’m reaching for. With the creaminess of guacamole, the freshness of cilantro and edamame, this has got to be one of my favourite dips, the fact that it’s so simple to prepare is just a bonus! Dip your chip into some of this dip, and enjoy the Oscars! Combine the edamame, avocado, cilantro, garlic, onion, jalapeno and lime in a food processor. Pulse until well combined. Add in the water and pulse another few times, taste for seasoning and add salt and pepper to taste, pulsing again to distribute the seasoning. Serve with your favourite corn or potato chips, and enjoy the Oscars, I know I will. I've made 'edamole' before too and it was delicious!